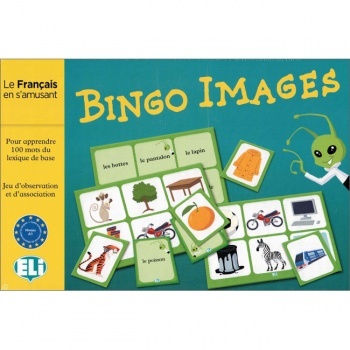 Young children will enjoy learning 100 basic French words with this colourful picture bingo / lotto game. Bingo Images teaches simple, everyday words and allows easy memorisation through picture-word association. Topics covered include colours, shapes, items of clothing, food, weather, animals, household furniture & many more. 36 double-sided game boards - suitable for both small groups and whole-class use! Bingo Images is equally suitable for children learning French as a second language, or for young native French speakers learning to read. Please note that the supplied instructions are in French - we are able to supply an English translation on request (free of charge - please let us know at the time of placing your order).